On 22 November last year the Plenary Assembly of the Bishops of France meeting in Lourdes gave the go-ahead to begin proceedings for the beatification of Elisabeth of France, sister of Louis XVI. The cause was introduced by the Cardinal-Archbishop of Paris André Vingt-Trois, and the postulator is the abbé Xavier Snoëk, parish priest for the church of Sainte-Élisabeth-de-Hongrie, in the Marais. The move comes after several previous initiatives by the French Church on behalf of Madame Élisabeth, the most recent in 1953 when she was declared a "servant of God" but the cause proceeded no further. This is, inevitably, a highly political move. Note that the formal “cause” for beatification is “martyrdom” (the other possibility being “heroic virtue”). The Church has already ruffled feathers with its martyrs of the French Revolutionary era – notably the ninety-nine guillotine victims beatified by John Paul II in 1984 on the eve of the bicentennial celebrations. These at least were refractory priests, nuns or pious private individuals, executed in the Terror. Madame Élisabeth's piety is not in doubt, but hers was a political execution. If this is “martyrdom”, it implies the complete identification of the French Catholic Church with anti-Revolutionary / legitimist opinion. 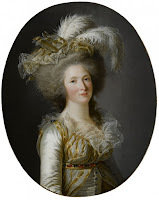 Unsurprisingly, one of the very few direct response to the Bishops' announcement, came from the comte de Paris “chief of the Royal House of France” who tweeted his approval: "Finally the Bishops of France have introduced the cause for the beatification of the sister of Louis XVI, Madame Élisabeth". One might suppose there would also have been adverse comment, but no, not that I can find. There is not much information to illuminate the circumstances of the new initiative. The lobby is a private society, the Association pour la béatification de Madame Élisabeth de France (ABMEF), founded only in March 2016. Its president is the Comtesse Marie-Ange de Pierredon-Callaud, proprietor of the splendid Château de la Roche, near Gencay, in the department of Vienne. There is no published list of members. IThe contact address is the church of Sainte-Élisabeth-de-Hongrie, rue du Temple. 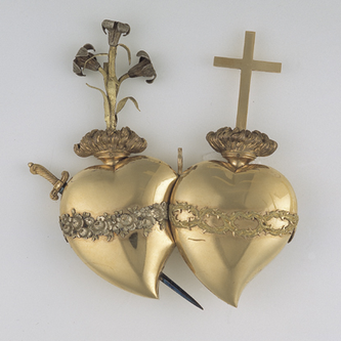 Ex-voto sent to Chartres Cathedral by Madame Élisabeth in 1790. Catholic Church of Paris, Opening of the cause for Élisabeth of France, 15th November 2017.